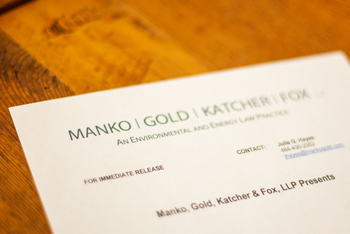 Philadelphia, PA (October 21, 2008) – Joseph M. Manko, a founding partner of Manko, Gold, Katcher & Fox, LLP (MGKF), an environmental, energy and land use law firm in Bala Cynwyd, Pa., was recently admitted to the American College of Environmental Lawyers (ACOEL). The American College of Environmental Lawyers (ACOEL) is a professional association of distinguished private sector lawyers who practice in the field of environmental law. Membership is by invitation and members are recognized by their peers as preeminent in their field. ACOEL members are dedicated to: maintaining and improving the ethical practice of environmental law; the administration of justice; and the development of environmental law at both the state and federal level.